Known for its electric coffee scene, there’s no shortage of local, diverse coffee shops here in Portland. With 6 weeks until The Sustainable Fashion Forum, we’ve logged countless hours sipping espresso and planning this year’s SFF. To kick off our Portland City Guide we’re sharing a few of our favorite places to grab a latte and hang for a bit. Keep scrolling to discover a few of our favorite coffee shops. It’s hard to go wrong with coffee and donuts. With six locations there’s a Coco Donut’s nearby regardless of where you are in the city. Our go to spot is the PSU location. If you’re visiting on a Saturday or Sunday you can fuel up before heading across the street to the PSU farmer’s market. Our recommendations: lavender glazed donut and rose white chocolate matcha latte. The newly renovated Sister’s Coffee is back with more seating, more lighting and an amazing food menu! If you’re craving something a little more than pastries with your coffee (although they have those too) Sister’s Coffee is the place to be! 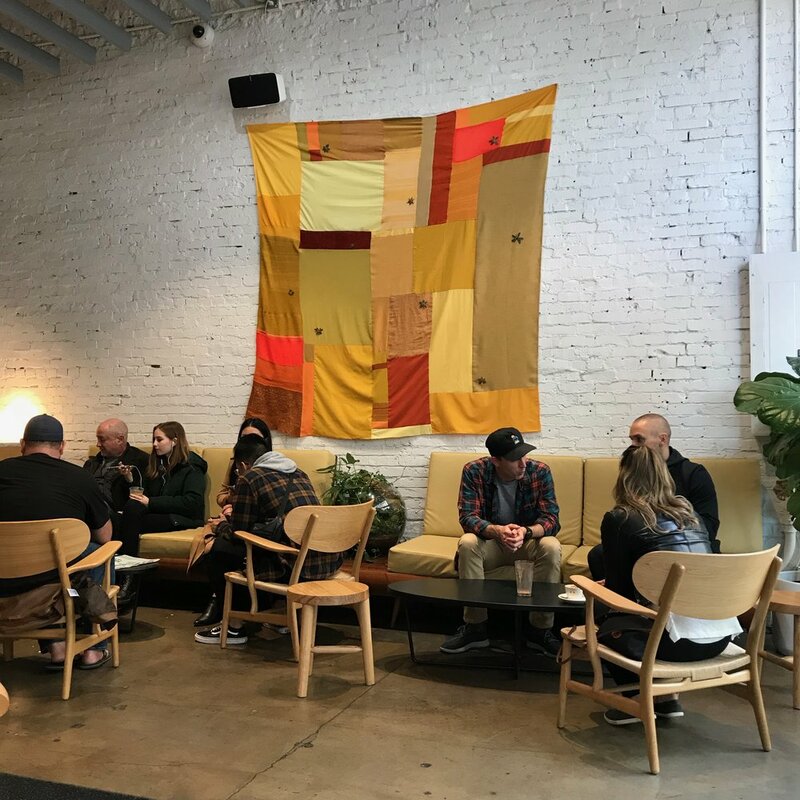 Whether you’re a regular or visiting for the first time, the employees at Good Coffee always make you feel like a close friend they’re elated to see. Think Cheers, if Good Coffee was a bar. With four locations our favorite locations are SE 12th and the newly opened shop at the Woodlark. If you’re looking for a quiet place to drink a cold brew and relax this is not the place to go. Between the bumpin’ music and the never ending opportunities to people watch (it gets pretty packed), it’s always a party at the Stumptown on 3rd. As huge supports of all things local, we love the Stumptown Artists Fellow program which periodically features local artists and artwork in the shop. There are a lot of coffee shops in Portland but Water Ave’s house made syrups and coffee specials like the torch-fired s’mores mocha definitely make them unique. P.S the food menu is available at their Water Ave location. Our recommendation: spicy avocado eggs sandwich and s’mores mocha!! Try one of these coffee shops while in town? Comment below and let us know what you think and stay tuned for more from our Portland City Guide series!